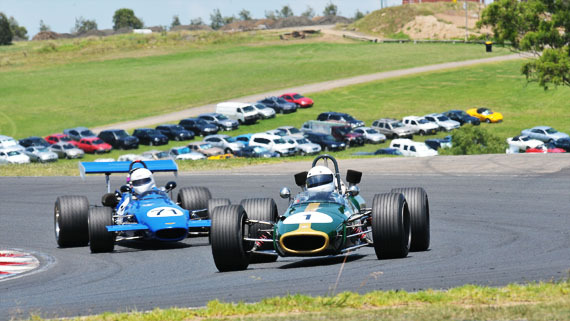 Once again the HSRCA is heading to Sydney Motor Sport Park to enjoy a weekend of historic sports and racing cars. We’ll be at the track this Sunday the 19th of August and will have a selection of wonderful racing and sports racing cars from the recent past on display. The star of the HSRCA display will undoubtedly be the 1967 Formula 1 Repco-Brabham BT24 driven by Sir Jack himself that year. Displaying the No1 on the side, as Sir Jack was the Formula One World Champion, this car won the French and Canadian GPs and was second in the Dutch, German and Italian GPs. It finished second in the World Championship to Denny Hulme, Brabham’s teammate driving another Brabham. Other cars will be another two Brabham 1960s racing cars, a locally built and very much used 1960s racing car called the Gryphon, a historic Formula Vee with quite a few wins to its name in recent times, a Nota sports racer from the 1950s being the Nota Minx, a Porsche 911, a Clubman, an Alfa Romeo and a Lotus Eleven from 1958 with early Australian history. These cars will be on display in garages 11, 12 and 13 and will put on a spirited display around lunchtime on Sunday. Can’t wait to catch up with everyone there! This entry was posted on Friday, August 17th, 2012 at 2:48 am	and is filed under News, Tasman Revival and tagged with 2012, Single Seaters, Sports Cars, Sydney Motorsport Park. You can follow any responses to this entry through the RSS 2.0 feed.